Below is a detail of the items of stock which are for sale in the shop. My new collection is called the Precious Collection and comes in a range of two styles. The Precious Collection Pearl, is a limited edition timepiece. 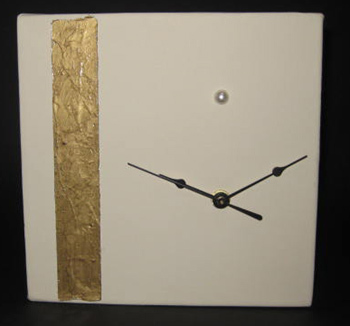 The clock features gold leaf and a pearl style embellishment. It comes one colour, soft cream and in one size is 8″ x 8″. An ideal gift for a special occasion or a special couple or person. It comes in a presentation black box. The second style is the Precious Collection Crystal, is a truly wonderful timepiece. 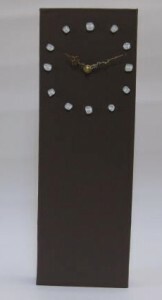 The clock features real timber veneer, gold leaf and a genuine Swarovski Cryatal. It comes one colour, soft cream and in one sixe is 8″ x 8″. An ideal gift for a special occasion or a special couple or person. It comes in a presentation black box. The latest collection is called the Funky Collection and is available in a range of six colour schemes. The size is in 6″ X 6″ , this is a limited edition collection. Handmade clocks with the style being based on the elements, wind, earth, water and fire. 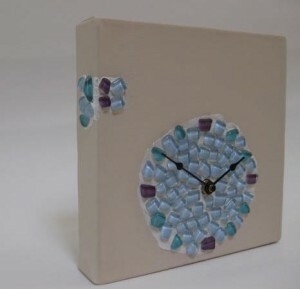 The canvas is embellished with coloured glass mosaic with the base colour being a complementary colour the hands used are either brass, white or black depending on the colour and how easy it is to read the time. Elements Collection,Wind,Fire,Water,Earth: Picture is for display purpose only, item featured is in the colour/scheme of the element “Wind”. 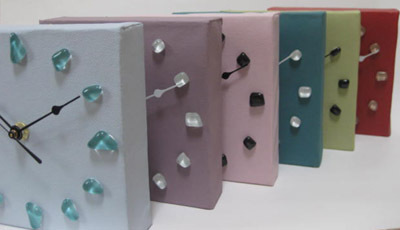 The Elements Collection come in a range of sizes 6″ x 18″, 8″ x 8″ and 6″ x 6″. Picture is for display purpose only. 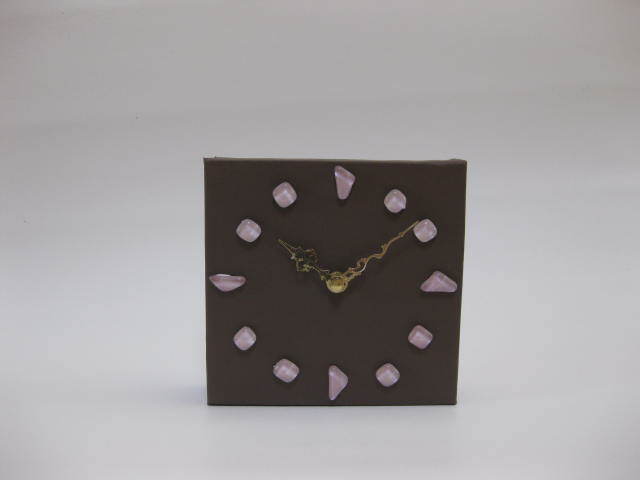 The Interior collection square one is a 6″ X 6″ contemporary timepiece available in Chocolate Brown, Rich Red or Warm Cream with fancy brass hands and embellished with glass. Each item is handmade and no two are the same. 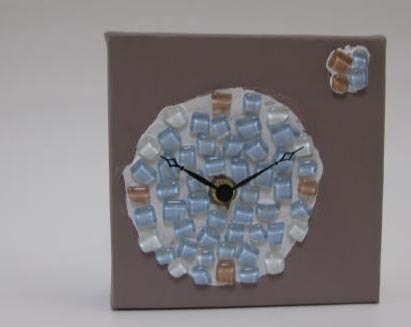 Contemporary functional art - containing working clocks, mounted on deep-based canvas. Picture is for display purpose only. Interior collection - Square one: This item can be made to suit the interior space - don’t forget you can customize the colour. The interior collection a Long 18″ X 6″ contemporary timepiece in Chocolate Brown, Rich Red or Warm Cream with fancy brass hands and embellished with glass. Each item is handmade and no two are the same. 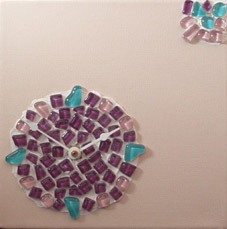 Contemporary functional art - containing working clocks, mounted on deep-based canvas. Interior collection - Long one: Don’t forget you can choose the colour of this item to fit in with your interior space. The timepiece is one for the Girls! 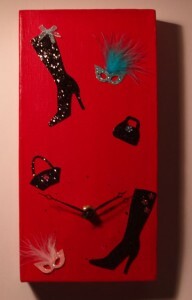 A rectangle in shocking red and embellished with boots and bags. Each item is handmade and no two are the same. 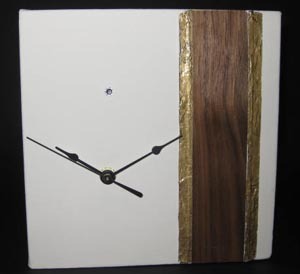 Contemporary functional art - containing working clocks, mounted on deep-based canvas. Gift wrap service is available on all items at an additional cost.